Wake up to the sound of the ocean. A beautiful timber, nautical style apartment. This Apartment is very popular with couples. 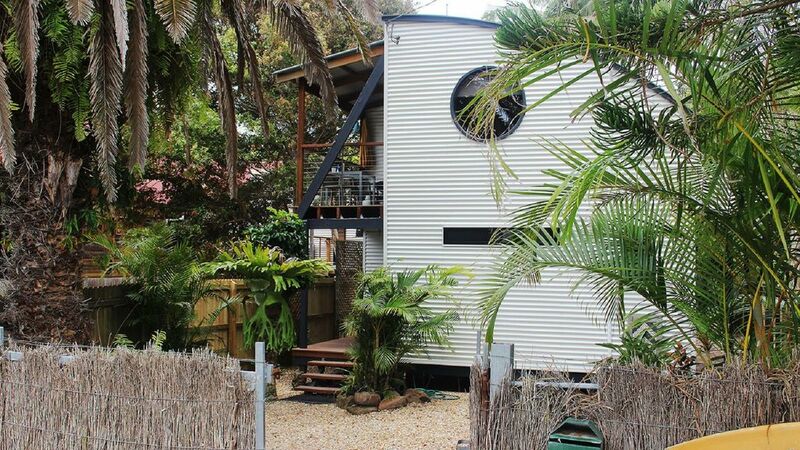 Located at Belongil, a very tranquil part of Byron Bay, away from the hustle and bustle. 50 m to the beach, 800 m walk to town centre. We are blessed with two great Cafes close by: The Tree House Cafe and the Belongil Bistro. The Apartment is north facing, very private and peaceful, and features queen-sized bed, lounge, kitchen (complete with fridge/freezer, microwave, small cooker/stove top and all pots, pans, toaster, cutlery, crockery, utensils supplied), bathroom, private balcony, barbeque, tv, video and cd player. In order to confirm a booking, we ask for a 50% deposit, in the form of a NetBank Deposit, cheque or money order, to be paid as soon as possible after booking. The balance to be paid upon arrival. Cancellation of booking will result in full loss of deposit within 14 days of arrival, 25% with more than 14 days notice. **Please Remember** A Booking is not confirmed until we receive your deposit and confirmed it with you. Close to the Beach and to town. We are on the street that runs along the Beach. There is a sand walk track through to the Beach. You can hear the waves at night. It is very relaxing. The deck has a lovely view of the local area. The balcony is the dining room....there is a BBQ and a table with 2 chairs with a great street view. Lovely sun drenched balcony for mornings and shaded in the afternoon. Birds visit from a large tree. Lovely location and neat,comfy accommodation.Thanks! My wife and I recently stayed at the Beach House, it was sensational. The property was located in a lovely quiet area with some cool coffee shops very close and the beach a short walk away. The house was an awesome place to stay, it had everything you could need, our only regret was we didn’t get to stay here longer. It was impeccably presented. Scott was excellent to deal with, very prompt with his replies and couldn’t have done anymore to accommodate us. We will definitely recommend this property to our family & friends. A wonderful seaside private retreat. Excellent property. Good size for a couple, very clean, lovely balcony to enjoy meals on, all a short two minute walk to the beach. Would definitely stay again. Thanks Scott! Stayed here before and again a comfortable and peaceful experience. Convenient location, well appointed apartment and good value. Byron Bay....on the Bay.....best beach.